Keep Your Home Ready to Show Without Losing Your Mind! When I take the time to tidy up, my workspace instantly looks better! Plus, I actually feel better about getting work done in that space. A space without clutter seems to create a serene vibe, which leads to a more peaceful frame of mind. Maintaining that sense of serenity is often a challenge, especially when selling your home. With your house on the market, you’ll want to keep your home “show ready” for spontaneous showings. Being ready to show your home on a moment’s notice may show that you are a motivated seller, prove that you are proud to show off your fantastic property, and spotlight how polite and accommodating you are, willing to work with a potential buyer! “Clean up one thing before bed, then, you have one less thing to do the next day.” Wise words from my college roommate, many moons ago, which still applies today! 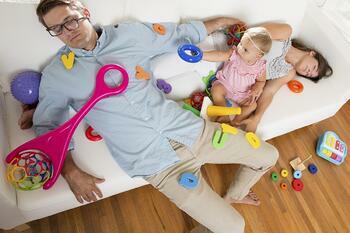 If you’ve picked up things around the place before going bed, you’ll be able to hit the ground running come morning. This makes waking up the next morning and looking around your house much less stressful! Try filling the dishwasher throughout the day and start it to wash before you go to bed that night. Then, while your morning coffee is brewing, empty the clean dishes from the dishwasher and you’ll have an open machine to fill throughout the day. To avoid tending to dishes while your home is on the market, consider using disposable plates, cups and silverware, if feasible. As much as you may crave a side of bacon, guests at your 9:00 a.m. showing may not appreciate the radius of grease spatter from your delicious breakfast. Consider making “easy” meals: salads, crockpot meals, meal ideas without a lot of food prep or cooking mess to help keep your kitchen sparkling clean. Consolidate your eating area to one designated place. At our house, we are “grazers”--we often eat meals in front of the tv, have snacks while relaxing on the couch, or carry goodies with us to the home office. An easy way to keep those crumbs from traveling is to only eat at one designated place, preferably the table. With this in mind, you’ll find cleaning up to be much less of a hassle, especially when on a limited time schedule before a showing. If the weather permits, encourage picnic time! Grill and dine al fresco on the patio or enjoy a picnic meal surrounded by nature at a nearby park. These are fun alternatives to cleaning up after meals in your home. Plus, the fresh air may relieve any stress you may be facing. Take a deep breath and look around. The beds are decked out with decorative pillows, the bathrooms are outfitted with fragrant air fresheners, the table has a delightful bouquet of fresh cut flowers, and the home is spotless. This is the perfect time to leave! Make plans each day to do things away from the home, leaving less chance to disturb the pristine atmosphere you have created. Make a plan for quick showings. You’ll want your home to be as available as possible for any potential buyers to stop by. If you have a plan in place, you may be ready within 30 minutes! 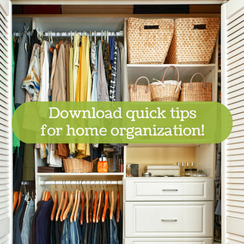 It may help to have an empty plastic tote handy to tuck any loose items from around the house. This tote can be easily stashed in the car for the duration of the showing. Stock your cleaning supplies with products for quick touch-ups, such as cleaning wipes, spot eraser sponges, and microfiber cloths. In a pinch, a dryer sheet may pick up dust from a tv screen or computer monitor, and sometimes pet hair from furniture. Above all, be open and honest with everyone living in your home. Explain the purpose of all of this preparation--the more showings you have of your home, the faster it may sell. By getting everyone in your family to work together to keep your home show-worthy, it may lessen the stress of selling your current home and make the transition to your next home a bit easier!